Tansy Barton, owner of the DogSmith of Volusia County, specializes in creating customized, practical and fun training programs that fit into your daily lifestyle. For Tansy, training is about helping you and your family pet members learn to communicate while building a strong bond of trust that will bring many years of love and companionship. Her approach is rewards-based which helps your dog clearly understand the behaviors you are asking for. Tansy believes there’s no dog that can’t be trained. You simply need to figure out what motivates each individual dog and dispense ample doses of positive reinforcement. Ironically, it was Tansy’s fear of dogs as a young child that led to her passion for dogs as an adult. At the very young age of three, Tansy was badly bitten by a friend’s family pet, “Chainsaw”. The name alone should have warned her off but Tansy had played with Chainsaw often. On one particular occasion Chainsaw latched onto her arm. Nearby adults came to the rescue but the incident left Tansy terrified of dogs so for many years she channeled her love of animals into raising and caring for cats, birds and even ferrets. But her innate love of training and caring for dogs prevailed and as the years passed, her fear transformed into an obsession to learn everything about dogs, how they behave and what motivates them. Now she brings her passion, knowledge and expertise to you and your family pets. With her husband, Kevin, Tansy shares her home with Harley and Chopper, two Miniature Pinschers, and Chopper’s best friend, a rescue cat named Kitty Dominic. Through life experience, certification, continuing education and as a proud member of the Pet Professional Guild (The Association for Force-Free Professionals), Tansy provides you with the most humane, effective and progressive training and pet care available ensuring you and your pets a healthy and happy life. 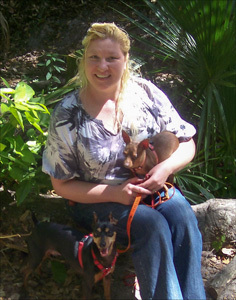 Tansy offers private In-home and group training as well as behavior consultations. She is also a licensed presenter for Dogs & Storks and Dogs & Baby Connection providing parental education on dog body language, dog & child safety and preparation for a new baby in the home.